(2006-10-04) What is West Nile Virus? West Nile virus is a virus commonly found in Africa, West Asia and the Middle East. It is not known how long it has been in the United States, but the Centers for Disease Control and Prevention (CDC) believe the virus probably has been in the eastern United States since early summer 1999. How can I reduce my risk of getting West Nile virus? 1. Apply insect repellent that contains DEET (N, N-diethyl-m-toluamide). Be sure to read label instructions. Spray clothing with repellent as well as exposed skin. 2. Dress in long sleeves and long pants when you are outside. 4. Drain standing water in your backyard and neighborhood; old tires, flowerpots and clogged rain gutters are mosquito-breeding sites. Most people infected with West Nile virus will not have any signs of illness. Twenty percent of people who become infected will have mild symptoms such as fever, headache, body aches and occasionally a skin rash on the trunk of the body and swollen lymph glands. The symptoms of severe infection (West Nile encephalitis or meningitis) include headache, high fever, neck stiffness, stupor, disorientation, coma, tremors, convulsions, muscle weakness and paralysis. Only about one out of 150 people infected with West Nile virus will develops this more severe form of the disease. The incubation period of West Nile virus in humans is three to 14 days. Symptoms of mild disease may last a few days. Symptoms of severe disease may last several weeks, although neurological effects may be permanent. Rarely, death can occur. 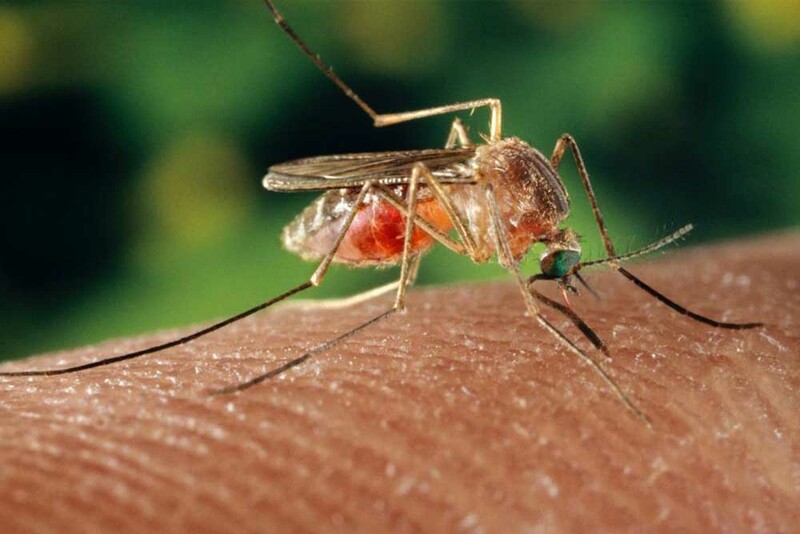 West Nile virus is spread by the bite of an infected mosquito and can infect people, horses, many types of birds and some other animals. There is no evidence that West Nile virus can be spread from person to person or from animal to person. People over 50 years of age have the highest risk of severe disease. It is not known if people with weakened immune systems are at an increased risk for West Nile virus. There is no specific treatment for West Nile virus infection. In severe cases, intensive supportive therapies are indicated, such as intravenous fluids and medicine to control fever or pain. Antibiotics may be given for any secondary bacterial infection. Can I be vaccinated for West Nile virus? Currently there is no vaccine for West Nile virus, but several companies are working toward developing a vaccine. Is this a seasonal virus? West Nile encephalitis cases usually occur in the late summer or early fall. However, Texas has a variety of climates; and when temperatures are mild, West Nile virus can be transmitted year round. It is best to try to protect yourself all year. How likely am I to be bitten by an infected mosquito? Fewer than 1 percent of those bitten by infected mosquitoes become severely ill. If you have the symptoms mentioned on this flyer, contact your doctor immediately. West Nile virus information can be found on the Texas Department of Health Web site at www.tdh.state.tx.us and the CDC Web site at www.cdc.gov/ncidod/dvbid/westnile/index.htm.